Does the rear camera on your iPhone 4 no longer take pictures, or takes fuzzy pictures or shows artifacts on the iPhone screen? Maybe the camera pictures have a coloured tint? 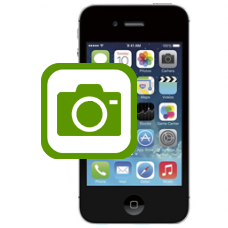 If so your rear iPhone 4 camera is no longer working correctly, we will replace with a brand new rear iPhone 4 camera part. If your iPhone 4 camera flash is no longer working this camera replacement also restores the flash unit on the iPhone 4 to full working order.